The opening shots of the so-called trade war have actually been very kind. It’s the sort of stuff Keynesian Economists live for. Activity has been accelerated across a broad front. 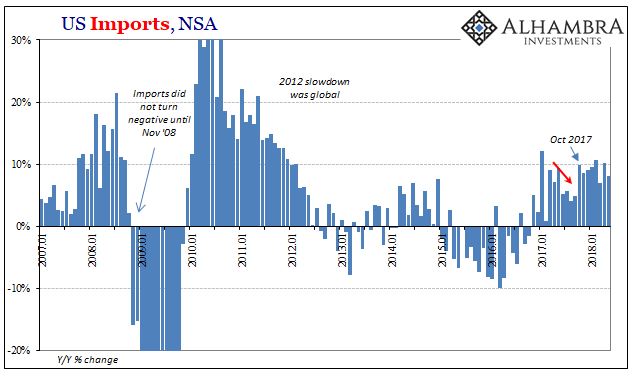 US imports moved first and now perhaps US exports are in on it, according to the latest Census Bureau estimates. To begin with, the import side. Inbound trade rose 8% year-over-year in May (unadjusted). The pace of import growth has leveled off this year, suggesting temporary factors included in that rate. The first was the aftermath of last year’s hurricanes striking the Gulf Coast. Imports rose sharply during those months, particularly October and November 2017. Outside of them, however, imports have barely budged. Of the 8.7% yearly change (seasonally adjusted) nearly all of it is derived from just the four months immediately following the big storms. And outside of a second jump in February 2018, coinciding with the big influx of Chinese goods, they have been essentially flat again this year. I think the trade war effects are most visible in the figures pertaining to trade with China. Through January, growth had averaged about 10% which is significantly less than what the Chinese economy needs for maintaining reasonably balanced expansion.  In February, the year-over-year change jumped to nearly 20% as political interference seemed increasingly likely. 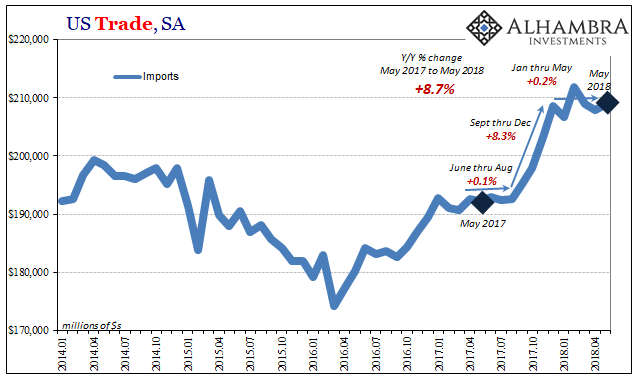 Over the last two months, Chinese import growth has dropped back to nearly flat. In April, the rate was just 2% and now in May only 4.8%. I don’t think these represent a US slowdown (demand), more likely the channel stuffing from earlier in the year in anticipation of tariffs begin imposed. Everyone knew it was going to start with China. 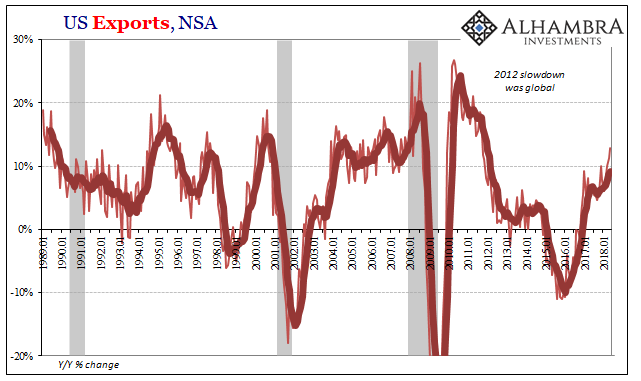 US exports have accelerated sharply in recent months. In May 2018, unadjusted exports rose by 12.9%, the highest growth rate since 2011. That might be the delayed emergence of globally synchronized growth, or it may just be US firms doing their own channel stuffing preparing in anticipation of retaliatory trade barriers. It would proceed imports first then exports, as US policy starts and others seek to answer. Trade figures both into and out of Europe would seem consistent with this idea. Europe’s economy has slowed substantially this year from an already low level last year. Yet, in the last three months (starting in March 2018) US exports to the EU have grown by 15.7%, 17.2%, and now 17.9% in May. The Europeans have been threatening reprisals for several months. With tariffs now being imposed at least so far on Chinese goods flowing into the US, it’s pretty clear this isn’t just bluster. The same trend is exhibited on the import side. US demand for European goods has jumped, too, despite what had been a stronger euro. Though the euro is lower since mid-April, it remains higher than in comparison to early 2017. This is one of those reports where, depending on your point of view, the estimates can confirm whichever interpretation you fancy. 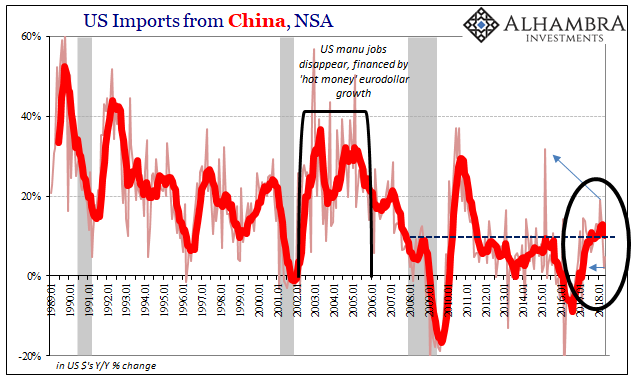 Though I think the import side is perhaps a little further along in the process of breaking out of these temporary factors, we can’t really know for sure for another couple months until shifting trade policies settle into reality (or not).